Today I introduce a new category of blog posts, which I have named "From my Journal." 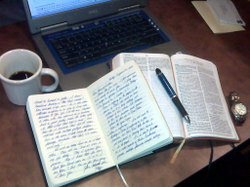 I keep a daily journal in which I write my prayer life to our Lord. I do this most mornings very early. It is so personal that only a few people - my wife and children - have access to it. (My dad could see it too if he ever asked.) I learned from an earlier blogging experience not to try to include regular entries into my blog, because I found myself restricted in my journal experiences. I couldn't write about the most personal and intimate issues because I was always thinking about the public nature of the blog. So the two universes, Church Requel and my personal journal, are separate but parallel. Never the twain shall meet. Until today. "Share in suffering for the gospel by the power of God, who saved us and called us to a holy calling, not because of our works but because of his own purpose and grace, which he gave us in Christ Jesus before the ages began." What does this mean for me as a church leader today? Below are some of my thoughts written over the course of the past several days. "Share in suffering..." I'm not used to thinking in terms of suffering as a free American, but God's Word tells me this is part and parcel of leading God's church. Why should I be surprised when I encounter difficulties? Why would I expect everything to go smoothly all the time? How should I be praying for people in other places who don't have the freedom I take for granted and who are suffering so much more than me? "... for the gospel..." It's so easy to focus on so many aspects of church leadership - finances, meetings, planning, example setting, encouraging. But I always need to remember the "why" of "what" I do: "for the gospel." "... by the power of God ..." I must always remember that I do not do this work in my own power, but God's. What should this tell me when I become stressed that "my work" is not getting done? "... who saved us ..." Do I get so focused on the salvation of others that I forget to celebrate my own salvation? Regardless of what I accomplish or don't accomplish, God has saved me. I am his child! "... called us to a holy calling ..." I love this part of Paul's letter to Timothy. God did not stop at saving me. His choice of love could have stopped at saving me. But God goes further and sets me apart (holy) for His calling. He calls me to be a part of His plan of creation redemption. This is an amazing fact, for the omnipotent, sovereign God could simply speak creation into rightness. Instead he calls me - broken, sinful, failed, weak me to be a part of His plan. "... not because of our works ..." How easy it is for me to forget the "how" of my calling. It's not because of my desire, my theology, my seminary classes, my history, my experiences, my friendships, nor for anything else I do or have ever done - no works of my own. So why does God call me? "... but because of his own purpose and grace ..." God has his own reasons for what He does, for why He calls me to this holy calling. I may not know ever exactly why He did it, what He has in mind. I just know it's not because of what I have done. So - no credit, glory should come to me. It's all God! I don't have to worry about my calling so long as it is centered in God, in his purpose, because of His grace. What a relief! Be the best Mark I can be - even if my purpose or grace fail - and let God be God, for His purpose and His grace will prevail. "... which he gave us in Christ Jesus ..." Who gave me "my works?" It is so easy to think it my own idea, my own will, my own efforts. In other words, it's even possible to credit the work itself to God to His glory, but somehow hold on to the spark of the idea for the desire to do the work with myself. But Paul writes that even this spark, this desire is God's alone. Further it can only be found "in Christ Jesus." Not only my salvation, not only my works - but even my calling can only be found in Christ. "... before the ages began." How awesome to know that every word I write, every sermon I preach, every kind word of compassion given to a distressed soul was given to me not just today, not even when I was born - BUT BEFORE THE AGES BEGAN! My work is God's work and was purposed in me and for me long before I even existed.